Blue Cross Blue Shield PSA: Helping or Shaming? Last month, Blue Cross Blue Shield Minnesota released a series of PSAs (public service announcements) about people making healthier eating and lifestyle choices, specifically focusing on the deeply contested and tense issue of obesity. Last week, Inhabitots, a green-minded blog devoted to providing parents and guardians with information on sustainable and healthy lifestyles and designs, posted a piece asking whether a particular Blue Cross Blue Shield PSA had a smart, effective message or whether it was fat shaming. In the video (interestingly enough, the video is no longer available via YouTube, but here is a screen shot) an overweight mother and her daughter (presumably also overweight by medical ‘standards’) are grocery shopping, each with their own carts. The audience is taken down a few aisles, following the pair from behind–you know, to really get the full effect of how physically “like mother like daughter” they are–and taking in tight camera shots of the products the mother is loading into her cart: super sugary cereal, orange soda, a tub of ice cream. I had to watch the commercial twice before realizing that everything the mother picks up, her daughter also puts into her child-size shopping cart. 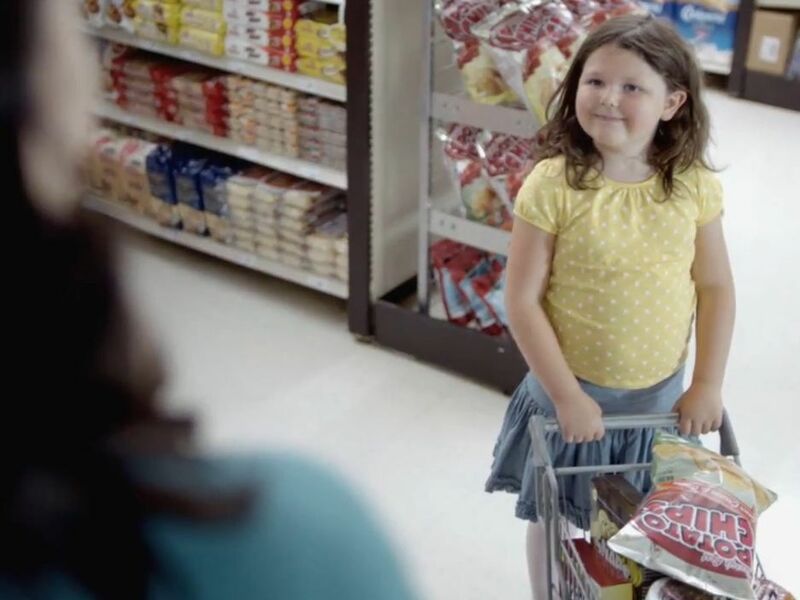 At the end of the commercial, her daughter’s cart is so full that her last bag of chips falls out causing the mother to turn around at which point we see her having an “Aha moment” about the importance of setting an example with seemingly harmless practices like grocery shopping. There is no dialogue in the commercial, just the white noise of a supermarket, and the words: Today is the day we set a better example for our kids. A colleague sent this article to me asking how I would use this PSA in a class on media? Or if I would use it at all. Even after screening the video a few times, reading the Inhabitots article twice, and combing through the Blue Cross Blue Shield MN website to get a better idea of the campaign, I was still unsure of how I felt about bringing this text into the classroom. However, after a brief brainstorm with my incredible sister (who is getting pretty damn good at this whole “media literacy thing,” I realized how important a message like this is. First, it is a public service announcement, not a Special-K or Yoplait commercial advertising fat-free products, encouraging weight-loss for beauty more than health reasons, and subsequently reinforcing skinny-as-ideal images and messages (not to mention using actresses that are already pretty damn close to this socially constructed “ideal” of what it means to be “pretty” and “happy”). The PSA, created by a health insurance company, is raising awareness and encouraging us all as consumers to reconsider how what we are putting in our shopping carts can directly affect lifelong food choices of the young people in our lives. I think it’s also powerful that there is no dialogue–that could have greatly ‘damaged’ the ad and I think pushed it further into the category of fat shaming to a point of no recovery. Prescribing the characters’ dialogue–inflection, content, attitude–could have greatly reinforced stereotypes or caused audiences to assume character traits and other lifestyle choices just by the sound of their voices, so that is definitely something to acknowledge. And third, if I were to use this in a classroom, it would be important to first contextualize the commercial in conversations about healthy eating, obesity, metabolism, and the importance of getting nutrients and vitamins from an early age (healthy lifestyles is a life skill, and a 21st century skill as far as I’m concerned). I would then screen the advertisement twice, without conversation, so that students can take as many elements of composition in. 1. Who is the author and what is the purpose of this message? Working through these five questions would enable us to have an engaging conversation about a serious topic like obesity; would help us to identify and understand how, in fact, we are probably meant to feel some disgust or disapproval towards the mother and daughter (based on the fact that we are socialized and normalized to associate overweight people with being “ugly,” “unhappy,” and place them in a deficit model of living); but how we must then also reveal and work to understand how easily stereotypes about demonized populations can be reinforced through the images and messages chosen for a media text. All in all, I think it’s an important text that fits very well into the current wave of media literacy theories and approaches that focus on empowering youth to be active participants, not passive consumers, in their increasingly MEDIAted lives. Educators need to bring these types of texts into their classrooms. They need to have critical conversations that consider both the potential benefits and consequences of public service announcements like this one. By working with students to deconstruct a text like this, educators have a unique opportunity to provide students with a set of skills and tools that they will need to identify and analyze media images and messages that they do not agree with in future encounters (which might very well occur before the end of school today). *I apologize if this statement comes across as flippant/uninformed/too simplistic. I am fully aware that there are important nuances to consider such as medical conditions (physical, mental, emotional) that can contribute to severe weight gain; however, for the scope of this PSA and conversation that is focusing on grocery shopping, there is an undeniable element of choice that goes along with the activity that must be recognized. I also acknowledge and understand that there is a financial aspect to food choices (e.g. the more unhealthy foods tend to be more affordable), but again, for the sake of this post, I hope you understand the point I’m trying to make here.